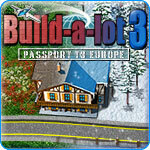 Build-a-lot 3: Passport to Europe Game Review - Download and Play Free Version! Objectives are clearly labeled and each level brings new challenges. Concise tutorial is helpful and leads to a quick mastering of the basics. Levels tend to be small. After two other jaunts as a real estate aficionado your taking your skills across the pond to the various neighborhoods of Europe. Stamp your passport in countries like England, Spain, Switzerland, and Italy as you help the local agents spruce up the towns with an assortment of buildings. Purchase or build English cottages, Venetians, and Spanish haciendas as you attempt to meet each goal and get the greatest career earnings. Build-a-lot 3: Passport to Europe takes some of the more popular elements of this construction strategy series and adds on some new and interesting components. 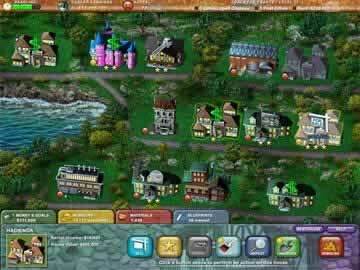 It retains the intuitive interface and informative, simple menus as well as the fun curb appeal factor introduced in Build-a-lot 2: Town of the Year, but adds onto this feature by introducing run-down lots which produce no income and have negative appeal. The run-down lots can be purchased, however, at low prices, fixed up, and sold for quite a healthy profit. Additionally weather conditions have been added into the gameplay which are not only visually entertaining, but also affect the speed at which outdoor jobs can be accomplished, such as repairs and painting. Build-a-lot 3 presents another great addition to this excellent series. Put your strategy skills to the test as you are kept on your toes, always trying to plan ahead to meet the deadlines. With 43 levels, there are more than enough challenges to keep you busy. The ability to replay any level and two game modes, a timed and a casual untimed mode, means that you'll get plenty of playtime from this absorbing title. If you are a fan of the series or like real estate strategy games, download Build-a-lot 3: Passport to Europe and break ground today! Build-a-Lot 3: Passport to Europe is a real estate development game in which you buy and sell homes for a profit. This game stays true to its Build-a-Lot roots, while exploring different locations abroad in Europe. Success in this game hinges on completing objectives and building quality neighborhoods. A concise and easy to understand tutorial starts as the game begins. This brief help guide makes for a quick and thorough understanding of the game and its strategies. Each level you start with money and complete objectives based on your ability to buy and sell houses. Painting your homes' exterior, upgrading your homes through kitchen remodels, and the addition of game rooms all increase the value of each property. This leads to greater sale prices on the market or increased rent. Typically the objectives for each level consist of owning a certain number of houses our collecting a set amount of money for rent. These are the majority of the objectives, but sometimes the duties of the neighborhood also lie on your shoulders. At these times you may be required to build a fire department or town square. Both will benefit the neighborhood and are results of your work and influence. A couple interesting features of this game that are not seen in other Build-a-Lot games are travel and mother nature's influence. Passport to Europe has you jetting from country to country developing neighborhoods abroad. This is great because the travel takes some of the monotony out of the game, and you get to explore new areas and build houses similar to those you'd find abroad. For example, you get to build a venetian house while in Venice. Mother Nature's influence also adds a challenging element to this game. The weather can often influence your work rate and the condition of your houses. 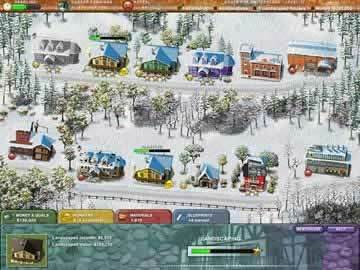 When it is snowing your construction workers will not be able to work as fast on building or on upgrades. Also, in treacherous weather your homes may incur damage. This feature offers a new level of difficulty that translates into a greater need for strategy. One drawback of the game is the quick rate at which you will progress. Playing for less than 10 minutes you will probably complete 2 or 3 levels. This could be fun and keeps the game moving, however, it takes away from the “start small and grow” strategy. These small levels may also stifle your creative freedom as a simulation enthusiast. You will not be able to build houses where ever you please because of the format of the game—designed for small and simple levels. Also, because of the level system, your results from the previous level do not carry over to the next. You may have built a superior neighborhood in level 7, but in level 8 those houses are gone and you are starting fresh with new materials and tasks. Overall, Build-a-Lot 3: Passport to Europe is a nice take on the real estate market, with a key emphasis on buying and selling homes. This will keep you entertained for countless hours whether you are a real estate expert or just a fan of simulation games. The smooth gameplay and engaging theme of real estate development will keep both the casual and more intense simulation style gamers happy. Build-a-Lot 3 is a fun and easy to play game, suitable for all ages. See the various actions you can take as you refurbish and build up these European neighborhoods in your quest for greater profits.